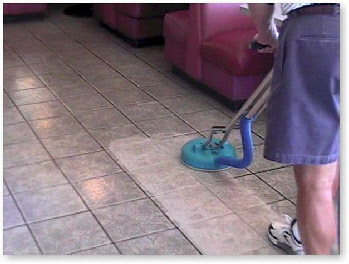 Professional Tile + Grout & Stone Floor Cleaning. Looking for a professional Tile & Grout Cleaner in Dorset ? give you a stunning clean every time. technology to do a fantastic job. Covering Weymouth, Portland, Dorchester, Yeovil, Bridport, Beaminster, Lyme Regis, Axminster, Sherborne, Shaftesbury, Gillingham, Sturminster Newton, Blandford, Poole, Wool & Wareham & Bournemouth. Get your tiles looking like new again with an intense steam clean & professional seal…. But the in between grout as well. Location where hard floor tiles have been laid. Our van mounted steam cleaners are capable of 3000 psi steam pressure heated up to 100 degrees to give the most intense and effective clean of hard tiles ever possible. – Our whole process involves :- hot alkaline prespray conditioner, rotary scrubbing of tiles & grout, steam cleaning and rinsing then pad dryed and buffed. You’ll find this is the most intense steam clean you rtiles will ever get, making them gleam & shine like new again with the grout looking pearly white ! – If You need them sealed, no problem….Matte, Satin or Gloss we can give them that just new look ! 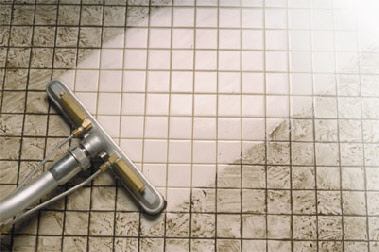 Tile & Grout cleaning is one our specialist fields. – Whether its Travertine, Slate, Marble, Ceramic, Porcelain, Granite, Stone or Quartz, we have the skill & know how to look after your tiled floor. 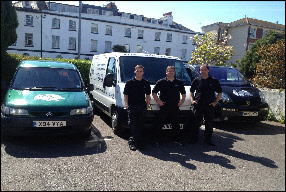 Serving our customers in Dorchester, Weymouth & Portland, Bridport, Yeovil, Blandford, Poole and surrounding areas in Dorset.